In the spring of 2016, Jody Anne McDonald’s Grade 4/5 students at St. Anthony’s Catholic School in Chalk River engaged in a learning experience that reached across the nation and into the palace of Queen Elizabeth. McDonald and Educational Assistant Maggie Kelly built on the occasion of the Queen’s birthday to develop students’ knowledge about the monarch. McDonald explained that students were invited to express their best wishes and birthday blessings to Queen Elizabeth through a formal letter-writing assignment and created unique handcrafted birthday cards. The class walked to the local Post Office to mail the package. The writing assignment naturally extended into a math lesson. The students were anxious to see if the Queen would respond to their letters. They were not disappointed. Recently, a reply was received from Queen Elizabeth’s Lady-in-Waiting expressing the Queen’s pleasure and noting the students’ thoughtfulness. “The Queen was pleased to hear from you and Her Majesty greatly appreciates your kind words,” wrote Annabel Whitehead from Balmoral Castle. 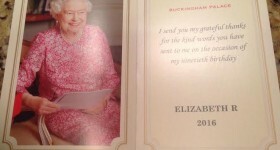 The letter was accompanied by a thank you card from the Queen. “When we received a reply from Her Majesty Queen Elizabeth the students were beaming with pride,” shared Mrs. Kelly.